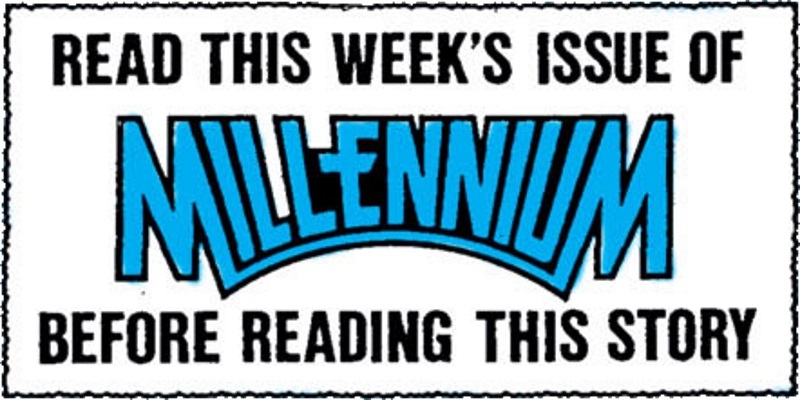 At the end of MILLENNIUM #7, Celia Windward spotted a limo near the Green Lantern Citadel and investigated it. Here she finds that Lex Luthor is the passenger and he invites her in before taking her to dinner. 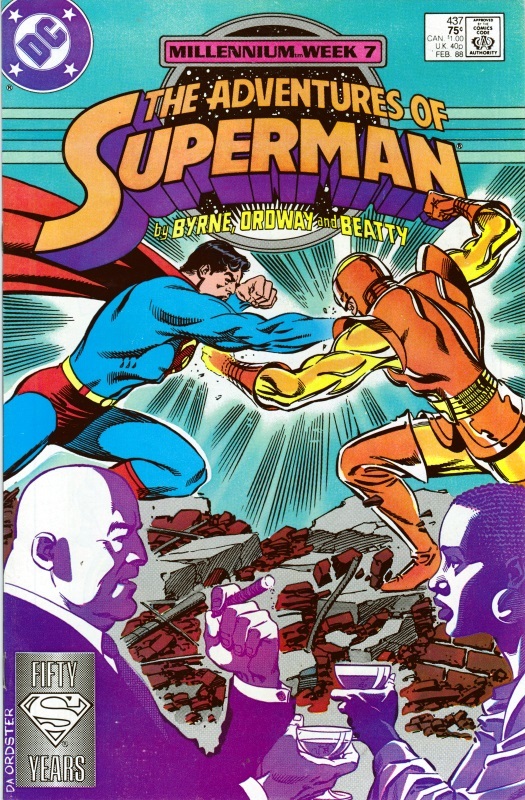 He tells her of a hypothetical fight between Superman and Combattor, highlighting Superman’s actions that endanger the innocent public as he recklessly takes down the villain. He finishes by telling her that the Millennium Event is a lie and that humanity has no nobility. At the same time, Lois Lane recounts the story of a date she had with a man named Jose Delgado, which was interrupted when Combattor attacked. Separated from Delgado, Lois was taken hostage by Combattor before the hero Gangbuster arrived, an ordinary man with no powers, but who stopped Combattor regardless, though at the cost of a broken back. At the end, Lois wasn’t surprised to find that Gangbuster and Delgado were the same person. Superman later accosted Luthor, informing him that Celia had told him of Luthor’s attempt to poison her against heroes, and that it had failed in part because of men like Gangbuster who did the right thing even without powers. Convinced the heroes do not believe he infiltrated the Manhunters on their behalf, Booster takes Xiang Po to Metropolis where he destroys his house and quits being a hero, in order to illustrate to her that the world is unfair. When the citizens of Metropolis turn on him for his public betrayal of the Justice League, it seems to confirm his point. He also discovers that Lex Corp have bought out his company, forcing him to steal his own jet in order to find Rip Hunter to convince him to return Booster to the future so he can escape his troubles. Members of the Justice League track him down and convince him that they believe his story about pretending to join the Manhunters, and offer him his place back with the League. 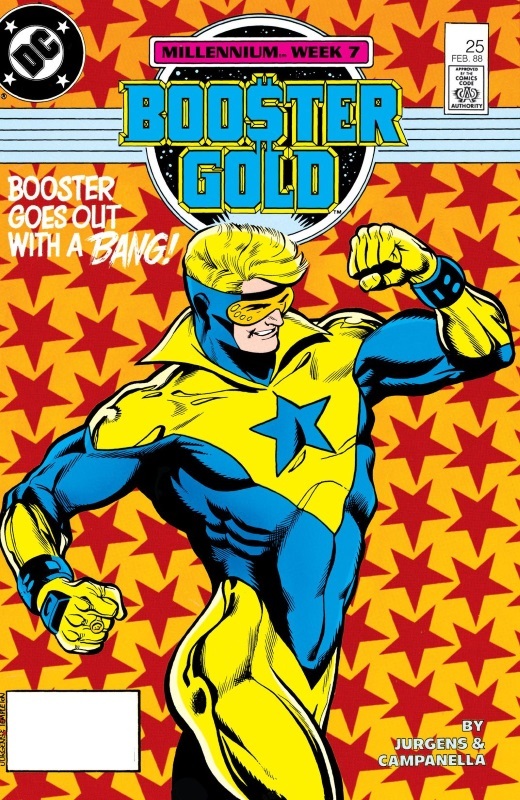 Realising that he is meant to be a hero after all, Booster agrees to stay. 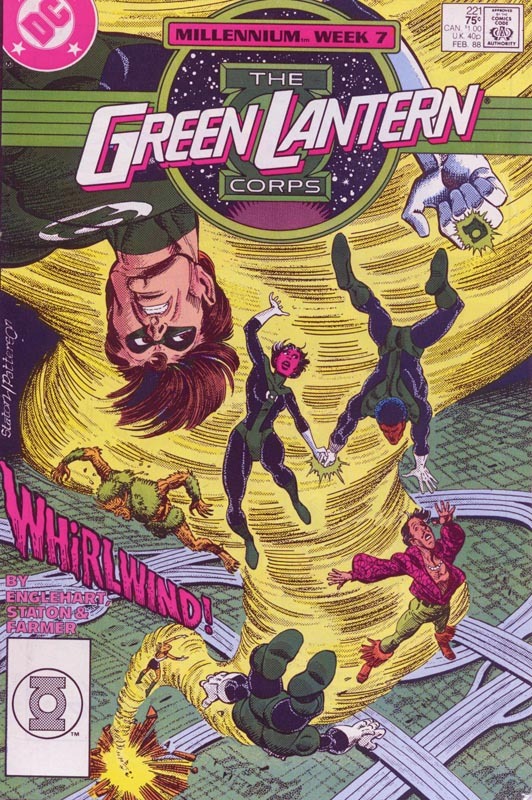 The Corps members take various of the Chosen to view parts of the world they’ve never seen; Gregorio de la Vega is taken to the moon where Sinestro is still held captive; Floronic Man is taken to Coast City where he meets Hal Jordan’s family; and Takeo Yakata is taken to Detroit to meet John Stewart’s mother. At each place, seemingly natural disaster break out and are dealt with by the Lanterns before the culprit – the wizard Myrwhydden – is revealed. The attacks prove to be distractions used to drain the Lanterns of their energy which in turn is used by Myrwhydden to free Sinestro. The Chosen deduce the wizard’s plan, however, and fly to the moon, capturing both Sinestro and Myrwhydden before they can escape. After visiting Molly Scott and Dan Richards in hospital, the Infinity Inc team split into two groups with the main group taking Betty Clawman back to Australia and Uluru where she is reunited with her tribe. There the male members of the team are invited to watch a man’s only ritual, while Betty soothes Wildcat’s annoyance at being left out by giving her a glimpse of the Dreamtime. Back in California, Obsidian is attacked by the Harlequin, apparently the last remaining Manhunter agent who somehow escaped from the Manhunter lair in MILLENNIUM #7. 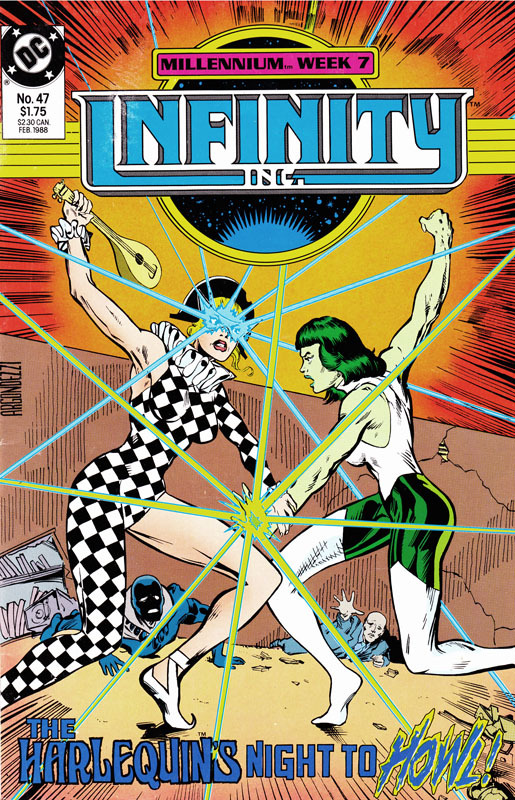 Jade attempts to stop her, but it is her grandfather, Dan Richards, who stops her killing the Infinitors, although he is shot by her in the attack and dies in Jade’s arms.